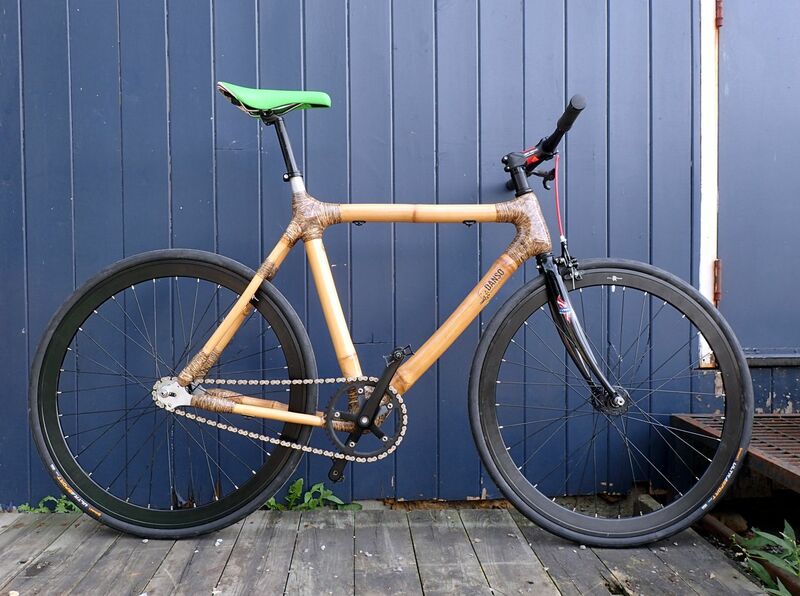 A bike for one, a bike for two, and now: a bicycle made from bamboo! I ran across this gorgeous specimen at Cyco’s Sports in Ottawa, Ontario. Did you know that these unique bikes are gaining popularity as eye-catching, socially responsible rides worldwide? 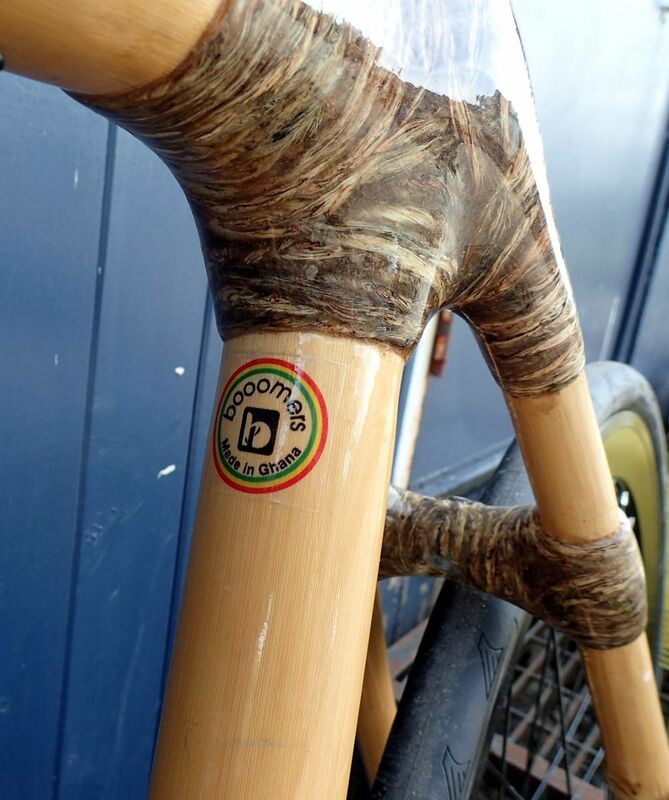 At present, most bamboo bicycle frames in North America, Europe and Australia are produced and distributed by the West African company Booomers International. Booomers manufactures about 50 bamboo frames a month from its factory in Apaah, Ghana, near the city of Kumasi. It builds frames in road, mountain, single-speed, urban and kids’ varieties, then markets most of its wares internationally through a network of distribution partners — including Danso Bamboo Bicycles, the sticker brand of the bike I saw at Cyco’s. Danso is based in Prince Edward Island, Canada. Fitted as a fixed-gear single speed. “Booomers – Made in Ghana.” Check out the wrap on the seat stay bridge. Booomers does a lot more than just build unique bike frames. The company is a subsidiary social enterprise of The Yonso Project, a non-profit organization dedicated to creating educational and economic opportunities in the developing world. Booomers directly employs 50 rural Ghanaian youth aged 18-29 in its factory, and creates work for another 30 in the area of bamboo cultivation and harvesting. Booomers also donates 15% of its proceeds back to The Yonso Project. The funds are used to provide scholarships, computer labs, library access and bicycle transportation options to rural students and communities across Ghana. Booomers frames – including the Danso frame at Cyco’s – are handmade from bamboo grown and sourced in Ghana. The bamboo tubes are joined using a thick wrap of sisal fibre (made from the leaves of the agave plant) and a bio-epoxy resin (made in part from cassava flour). Small aluminum parts wrapped into the tubes allow the frame to accept standard bicycle components like seat tubes, stems, axles and bottom brackets. The finished product – bamboo tubes plus sisal wrap – is coated with a high-quality polyurethane to protect the frame from sunlight and minor impacts. Read more about Booomers’ production process. Frame accepts any standard bottom bracket and crankset. Aluminum fittings accommodate the rear axle. 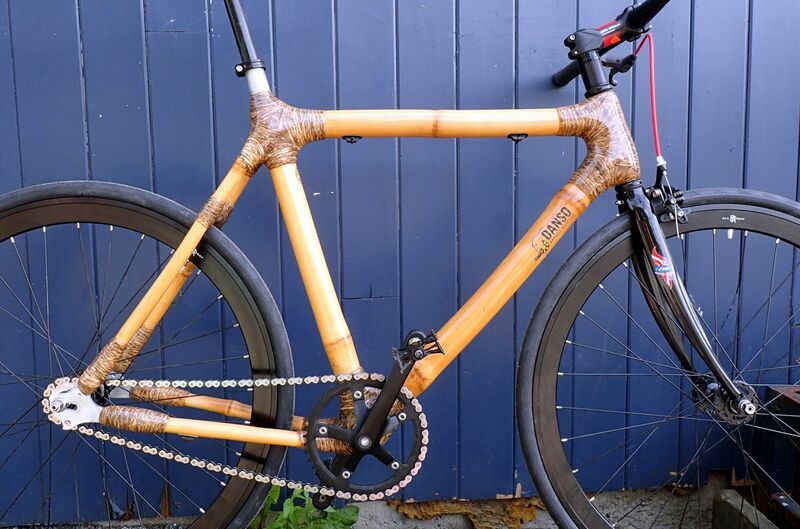 According to the Danso web site, bamboo is a great material for bicycle frames. It has more tensile strength than steel, more compression strength than concrete, more durability than carbon fibre, excellent vibration absorption and is antibacterial to boot. 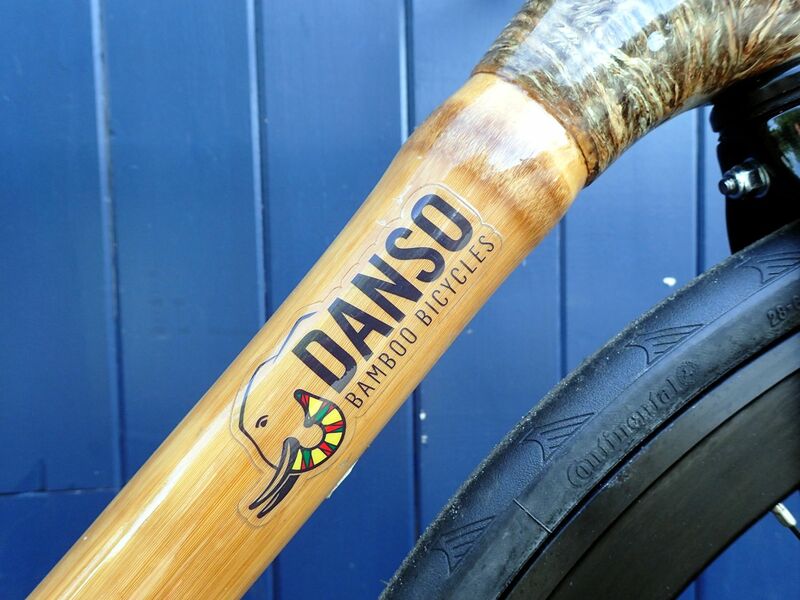 Although heavier than carbon or titanium, bamboo is “nearly impossible … to break under riding stress (including heavy impact),” says the Danso site. All that, and it looks cool, too. The Danso line of bamboo frames is named after Kwabena Danso, founder and CEO of Booomers International and executive director of The Yonso Project. Danso’s logo: an elephant with a trunk wrapped in Ghana’s national colours.